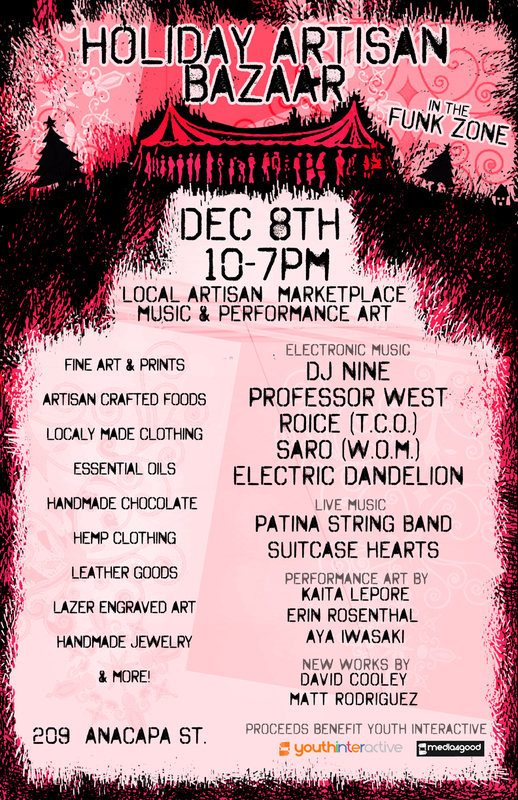 The Holiday Artisan Bazaar will take place on Saturday, December 8th from 10am-7pm at Youth Interactive which is located in the heart of the Funk Zone. The event will feature numerous local vendors, performance art and live music and DJs. We will also have food carts present to help encourage people to stay and enjoy the entire event. The event is geared toward anyone who supports our local artisan scene which is ever growing and being identified strongly with the Funk Zone. The event also benefits Youth Interactive www.youthinteractive.us, the host organization, which works with at-risk youth in Arts and Entrepreneurship and the umbrella organization Media4Good www.media4good.org, is a global media non-profit which uses film to effect positive change around the world.